These relays are rated for the maximum load of 1A per relay. To activate a relay, set the corresponding control line LOW. When left unconnected, control lines default to HIGH (and, hence, relays are off). Combine this Tibbit with terminal block devices -- #20 (nine terminal blocks) or #21 (four terminal blocks). There are two red LEDs which are connected to two SSR control lines. LEDs light up for the LOW state of control lines (i.e. 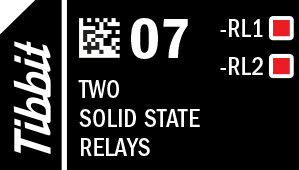 when relays are activated).